British Pie Week is drawing to a close, and what an eventful week it was! The Pierateers have travelled round the UK, eaten pies in a variety of ways, taken on pie challenges and seen some serious pie drama as a PASTY won the British Pie Awards. After hearing about all their adventures, I needed a pretty good #PiePledge to keep up with them. And so, I am very proud to present....the Great British Pierate Ship! Not only did I want to bake a Pierate Ship, I wanted it to be a Great British Pierate Ship, so I chose ingredients from around Britain. Herefordshire beef from England, neeps and tatties from Scotland (there was some debate about whether neeps were swedes or turnips so I used both), leeks from Wales and cider from Ireland (Magners is actually made in the Rebublic of Ireland which really makes this a British Isles pie, but that was the only Irish cider I could get so I hope nobody will mind). What makes this recipe even more exciting is that a beef and cider pie is sometimes known as a Smugglers' Pie - what better filling for a Pierate ship? I browned the beef with some salt, pepper and plain flour, then set it aside and cooked the leeks, neeps and tatties. Then it all went back in the pan with the cider for an hour and a half of very slow cooking. I also had some mushrooms lying around, so I added them for the last half hour even though I hadn't originally planned on using them. I made the whole pie out of shortcrust pastry - a good pastry for structural integrity! I used an enamel pie dish, some baking parchment and lots of baking beans to support the hull of the ship. And finally, once it was golden brown, add a sail and the Pierateers' flag! You can't really tell from the photos, but this was a lovely golden colour and very crispy, especially around the edges. This pie had a really nice consistency - the cider cooked down to make a lovely thick, smooth sauce. The capacity of this pie wasn't quite as good as it could be because of the unusual shape - if you ate the bow you go a lot of pastry. Still, I think it was worth it, and there was still quite a lot of filling packed in there. Cooking the filling for so long meant the beef was really tender and the leeks were lovely and soft. The neeps, tatties and mushrooms still had a little bit of bite left so they were soft but not too mushy. This tasted really really good - the cider and leeks added a nice sweetness to the meaty beef flavour, and the neeps and tatties reminded me a bit of a Cornish pasty (although it might be best if I don't say that too loudly after the British Pie Awards!) The last minute addition of mushrooms turned out to be a good idea, as they added a nice earthy flavour. This is a great value pie - root vegetables and stewing beef are cheap ingredients that taste great, and cider isn't too expensive either. 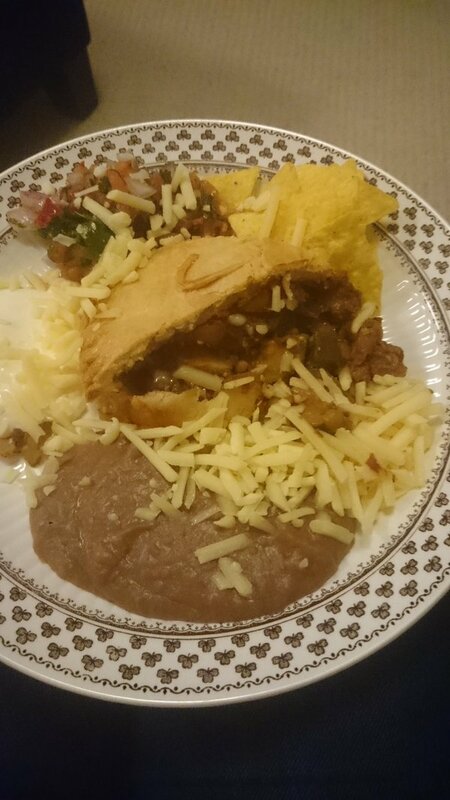 I ended up with loads of spare filling as well, which means I can make another pie sometime! I have to give myself full marks here - look at that pie! The shape definitely makes an impression and the pie held together when it came out of the tin! I'm incredibly pleased with the results of my #PiePledge - although now I'm a bit worried about trying to beat it next year! The Ship's Cook wasn't the only one cooking up a storm on the final day of British Pie Week! Our very own Pierateer ARL cooked a 7 Cs veggie pie especially for Pie Week! Check it out and find out the 7 ingredients in our Day Seven summary article!